Bernhard Wenke was a prisoner of war at Quorn POW Camp. His grandson Jürgen Schneider, kindly got in touch with the museum team and enabled us to tell his story. Bernard was 36 when war broke out. He was married to his wife Anita and they had three young children, a son Hans Dieter aged 6 and two daughters Marion (Jürgen’s mother), aged 5 and Ursula aged two. Bernhard was captured by British troops, close to Calais after D-Day, (6th June 1944). He was taken as a prisoner of war, and brought to the POW camp in Quorn. This was on the Farnham family land, the entrance being where the entrance to Northage Close is now. He had been seriously wounded by a shell which destroyed his left elbow. The injury was something that upset him for the rest of his life, as before the war he had played the violin very well, and it was a cause for great sadness for him, that he could no longer do this with his stiff and damaged arm. Jürgen remembers that someone told him that Bernhard worked as a translator in the camp. This is very likely, as official translators would be in very short supply, and anyone who could speak both languages, would be very useful. May these lines tell you that nothing changes here up to now. I do not know when I can be with all of you again. Please write to me! I didn’t receive any letters from you, only a third postcard. Everything is well with me. I hope that all of you are well too. Do you get my post on time? Every 8 days a postcard and every 14 days a letter? 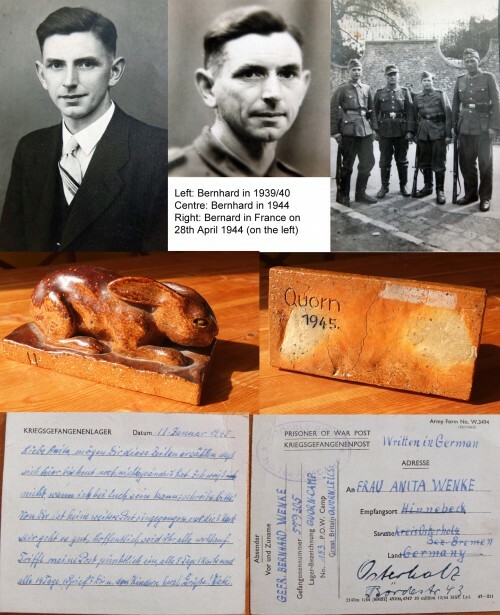 When Bernhard left Quorn, he took back to Germany with him a small terracotta clay rabbit (see photograph). It is not known whether this was a present, or a memento he acquired himself. If anyone in Quorn has ever come across a similar rabbit, the museum team would love to know. Jürgen tells us that, like in many German families, this generation of soldiers didn't talk much about their time at war. As far as Jürgen knows, Bernhard was a gunner in an anti tank battalion. Bernhard was released from Quorn POW camp in spring 1946. After he returned to Germany, he had to go into hospital for quite some time because of his seriously injured left arm. When he finally returned home, he went back to work as a school teacher in Hinnebeck, the little village where his grandson, Jürgen, would eventually grow up. Bottom row: The official POW letter card sent by Bernhard to his wife back in Germany, dated 11th January 1946. Missing information: Has anyone seen a terracotta rabbit like this before?